Love the new IN COLORS and what an adorable way to say PEEKABOO!!! 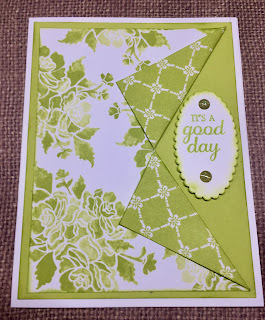 Card Base: Whisper White 8 1/2" x 5 1/2" scored at 4 1/4"
Layer 1: Lemon Lime Twist Cardstock 5 1/4" x 4"
Layer 2: Lemon Lime Fresh Florals DSP 5" x 3 3/4"
Begin by using Lemon Lime Twist ink and a dauber and ink edges of cardstock and designer series paper. Using your paper trimmer place the designer series paper 5" side up in the trimer at the 2 1/2" spot and make a slice approximately 1 1/2" down. Using a ruler line up the top edge of each side with the end of your slice and fold . 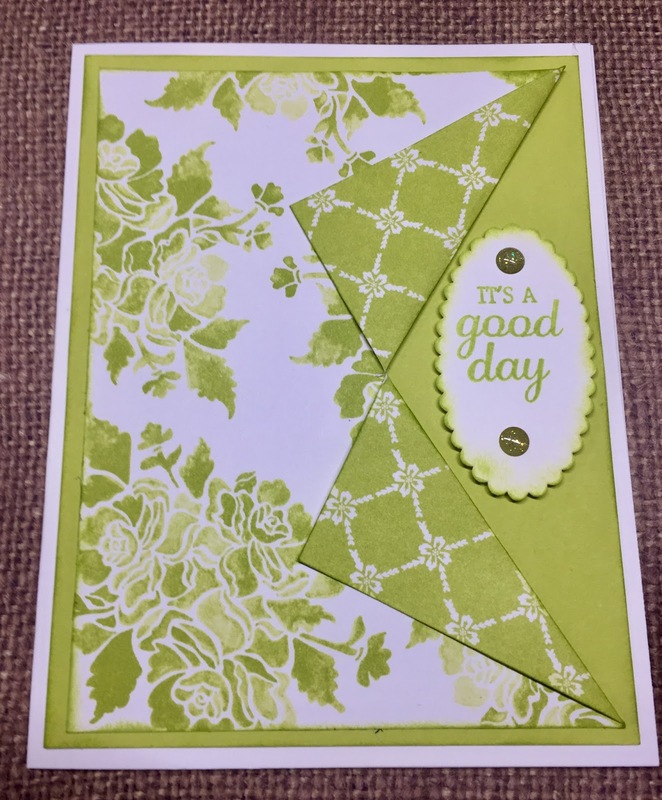 Using the 2nd to the smallest Scalloped Oval framelits and the piece of scrap whisper white cut your oval. Ink the edges with dauber and stamp your sentiment both with Lemon Lime Twist. Add Glitter Enamel Dots above and below sentiment. Place dimensionals on the back of sentiment to pop up and center in your opening.